I might be biased, but the coast in Dorset is one of the best places you can visit in England, and indeed the UK. Being my childhood home, I’m ashamed to say it took me nearly 30-years to drive the Jurassic Coast but it was well worth the wait. From pre-historic history to beaches you won’t believe exist in Great Britain, this is one road trip you have to do when you visit the UK. The Jurrasic Coast gets it name thanks to the millions of years of history imprinted into the towering cliffs along the coastline. Even now you can still find pre-historic fossils taking a stroll along the beach and just recently fossils from mammals dating back 145-years were discovered. Beyond that, the perfect ocean waters, cute pubs, fish and chips and fresh air hikes make this an ideal 3-day or even one week escape into the south of England. 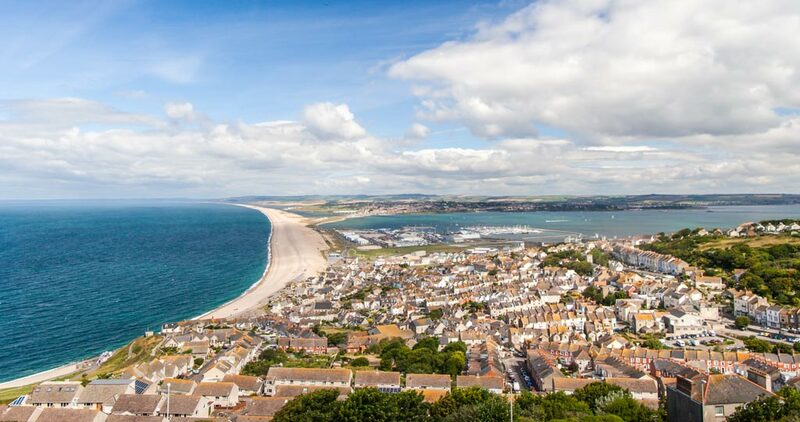 How to get to the Jurassic Coast: From London (or other parts of the UK) you can catch trains into the likes of Poole, Bournemouth or Weymouth as good starting points to explore the coastline. Some European airlines fly into Bournemouth and Southampton, or it’s just a couple of hours by coach/train from the main London Airports. Check out one of our UK train websites to book discount tickets in advance (https://www.thetrainline.com/). 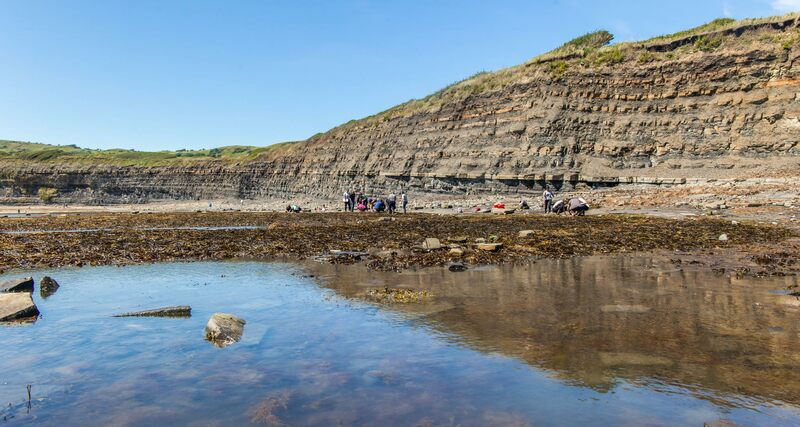 How to explore the Jurassic Coast: While you could see a fair bit of the Jurassic Coast using a mixture of trains and busses, not only can this quickly get costly but it will also be harder to visit some of the most scenic spots and limit your options for times. I’d recommend hiring a car to make the most of your time here. Where to stay on the Jurassic Coast: Good starting points are in Poole or Bournemouth where you could pick the car up and begin you road-trip. There is a whole host of accommodation across the Dorset and Devon coasts ranging from small BnBs to larger chain hotels. If you are travelling as a family or group consider booking a cottage along the Jurassic Coast. Expect prices to rocket and availability to be low during the summer months and, like where I stayed, some of the smaller accommodation can be a hit or miss. For a more affordable option check out Travel Lodges (a chain in the UK) which have some hotels at the start and end of the route. You can usually save even more money by getting a voucher code (https://www.groupon.co.uk/discount-codes/shops/travelodge.co.uk) – if you don’t want to shell out a lot of cash for a Boutique BnB and don’t mind not staying right on the beach, it’s an excellent way to save some money for exploring the rest of the UK. Take a video tour along my Jurassic Coast road trip in Dorset and then discover more by scrolling down. *This video only was produced on assignment for Cover More. After cruising along from either Bournemouth (my hometown) or Poole, your first stop should be in Swanage. One of the larger towns along the coast it’s only a short drive from Poole, and it’s the perfect place to get your first ice-cream or fish and chips lunch on the beach. Think deck-chairs and quintessentially British, and you’ll be spot on with expectations. This vast 320-acre nature reserve stretches all along the Isle of Purbeck just beyond Swanage and is included in the UNESCO Heritage Sight which is the Jurassic Coast. There is a small museum here, but it’s also a great place to park up and enjoy a hike along the cliffs which are dotted with lighthouses and walking trails. Be warned; parking is not free in Dorset so you’ll need to be carrying about £20 of change with you for this road trip. 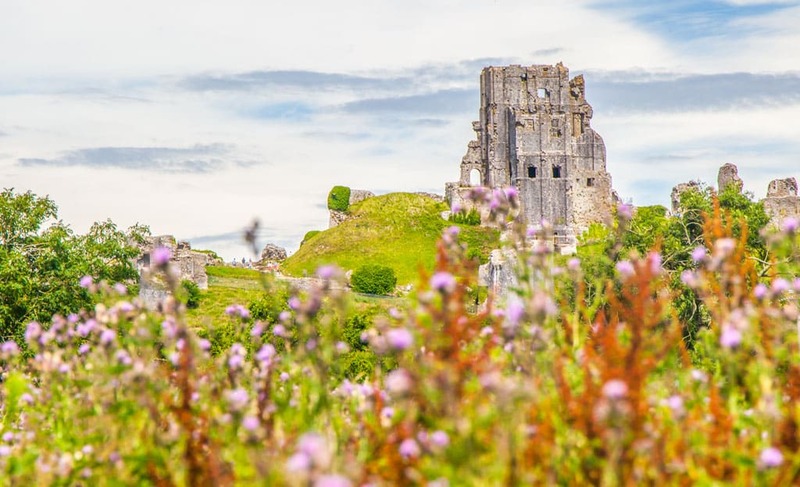 Take a little detour inland to visit Corfe Castle. The ruins of this fortification stand above the village of the same name which is packed with small tea houses, perfect for an afternoon tea stop. The old defensive castle which is from Roman times is one of the most popular National Trust historic sights in the country. This tiny fishing village is actually on private land, and as such, you must pay an entrance/parking fee to drive down here. The rocks stretch out into the water, and it’s one of the most popular spots to look for fossils on the beach thanks to the continual erosion of the cliffs here. While many people will skip it because it’s a little bit of a detour for me, it is one of the most beautiful places to spend a few hours along the Jurrasic Coast. 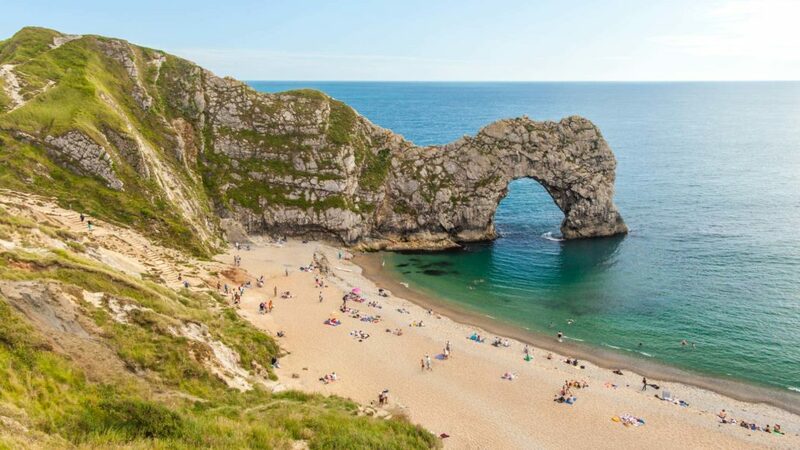 One of the most famous locations and photo spots along the Jurrasic Coast, you can park up at the perfectly curved Lulworth Cove and enjoy a swim or pub lunch before taking the short hike over the cliffs and on to Durdle Door, without a doubt the ‘poster child’ of this region. Not only is the water here more like the Med than England, but the beaches also bring in the crowds for sunbathing, swimming and relaxing at one of the most famed spots on the Jurassic Coast. The towering curved cliff that has the name Durdle Door attracts droves of photographers not just because of its dramatic location on the coast, but also the white-cliffs along these beaches make if by far the most beautiful all round location. Expect to spend a good few hours here, although the crowds can be intense in Summer, another reason I recommend you explore England during the off-season. The Isle of Portland got some international fame as we hosted part of the Olympics here thanks to the great water activities and conditions. The Limestone island sticks off the mainland with a stunning beach and the views from the top hill are impressive, as the town sits in front of you and water is on both sides. This is technically the most southern point of Dorset and on a clear day you can see for miles. 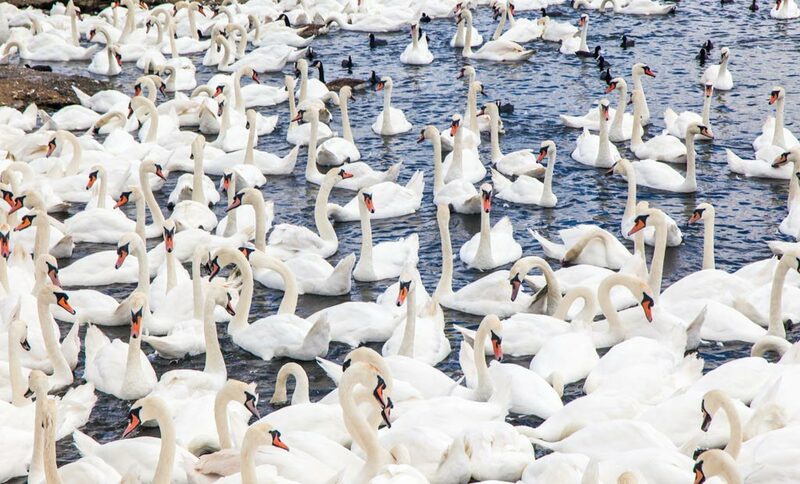 Did you know technically the Queen owns all the swans in England? A little detour is to the Abbotsbury Swannery where you can see hundreds of these white beautiful animals relaxing amongst little lakes and shade lined walking paths. You’ll need to pay to get in but it’s also a good place to spot various other bird life. 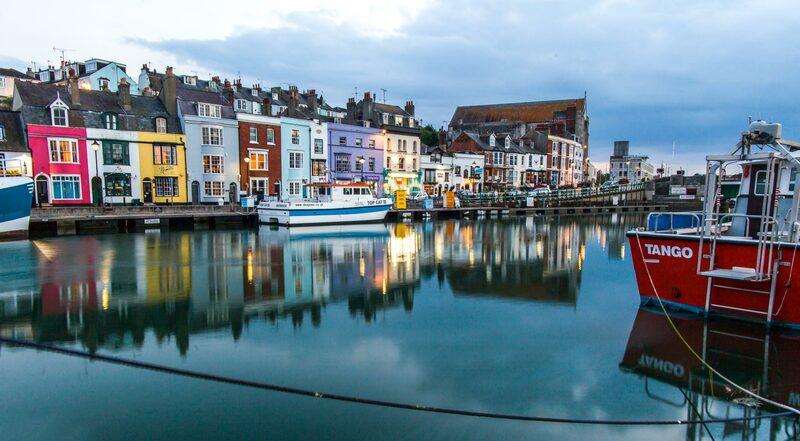 One of the biggest towns in the region, Weymouth has spruced itself up in the last few years, and I’ve even listed it as one of the best-hidden gems in Europe. 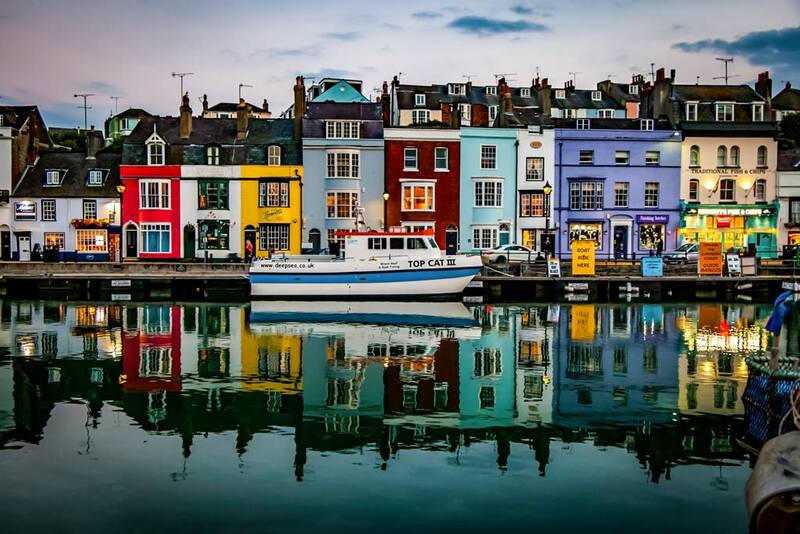 Partly because of its location to the Jurassic Coast but also it’s cute canals with colourful houses, new dining options and in June, the city comes alive for the annual Weymouth Festival. Big on events, you can expect a mini festival every bank holiday here too. By far the best location for fossil hunting, you can literally walk along the beach and usually pick up pre-historic fossils yourself. 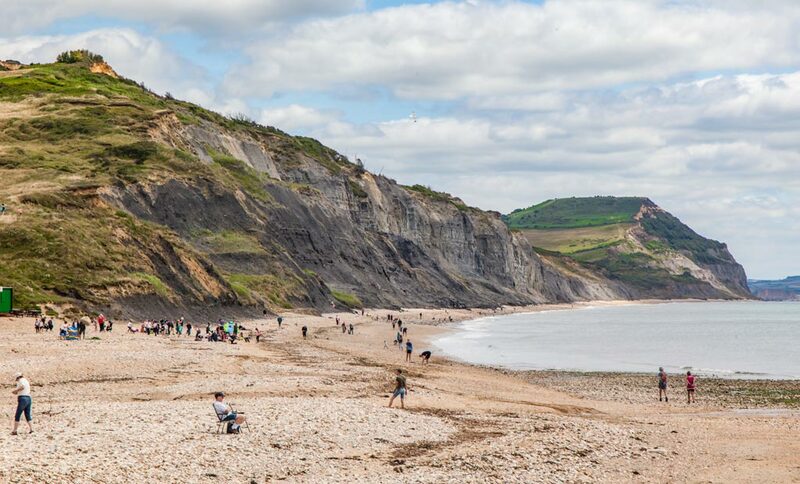 A little museum and gift shop will fill you in on more details, and while the beach itself isn’t ideal for relaxing and sunbathing, the impressive cliffs and chance to find your own slice of history make Charmouth a must-visit. 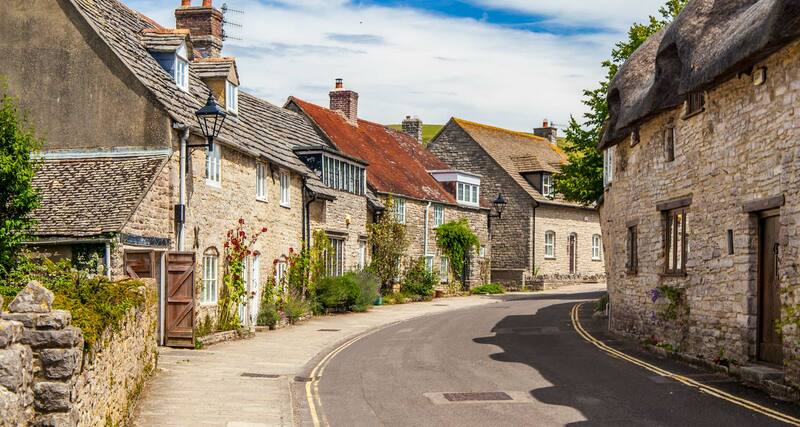 In West Dorset, not far from the Devon border, Lyme Regis is about as British as you can get. 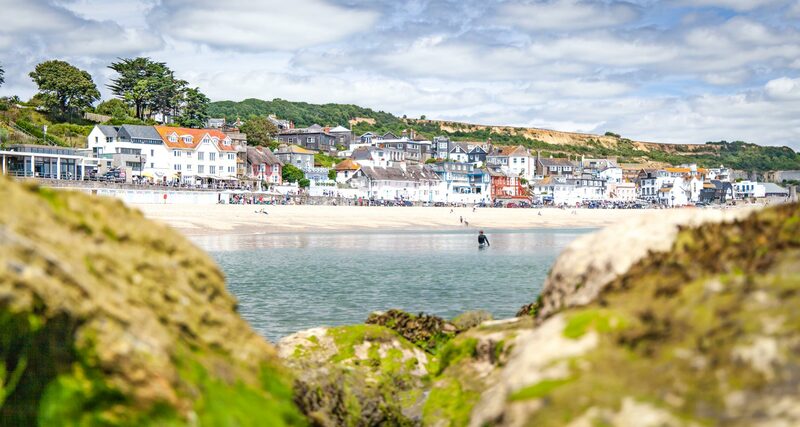 From little pubs, sea-side drinks, relatively still swimming conditions in the bay and a host of colourful, charming houses it is a popular spot for UK families to have a summer getaway. Often nicknamed ‘The Pearl of Dorset’ you’ll quickly see why this is regarded as a gem of the Jurrasic Coast. Seaton is another seaside town with a fair few amenities, and likely you’re turning around point if you don’t plan to continue to Devon. The whole of the Jurassic Coast stretches from Studland Bay in Dorset to Exmouth in East Devon, so you can certainly continue driving and discovering more beautiful sea-side spots. Since being added to the World Heritage List in 2001, the coast has become more popular, but you won’t struggle to find quiet places along the near 100-miles of coastline in the park. You could also swing into Exter, a popular student town with a grand Cathedral or take the drive out to stone-henge. A few months ago I also did a Rabbies Tour of South West England which offers the chance to visit some of the most famous sights with a small visit to the Jurrasic Coast compacted into a three-day tour from London. 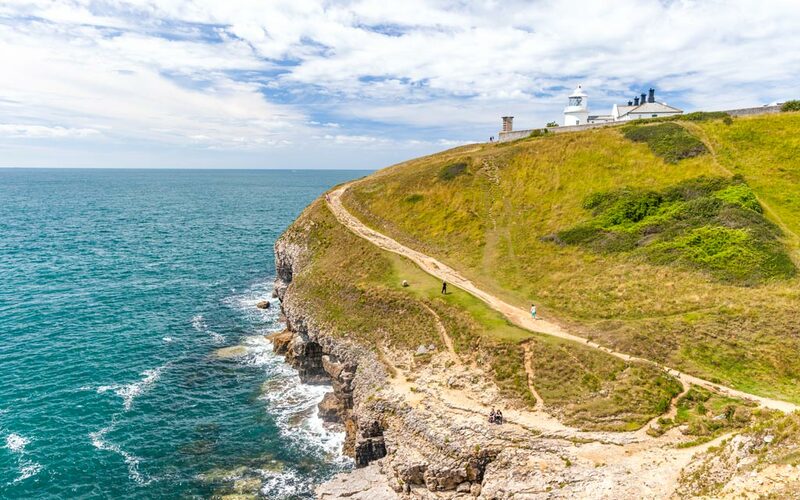 Whichever part of the Jurassic Coast you explore you won’t be disappointed, just make sure not to miss my fantastic home county when planning your visit to England! 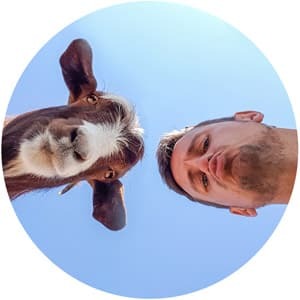 Hey Dan – Great blog post! In the 3 days, in what towns did you stop to stay overnight? Hey Dan, your blog is great. I’m heading to the UK this year so its been super useful. 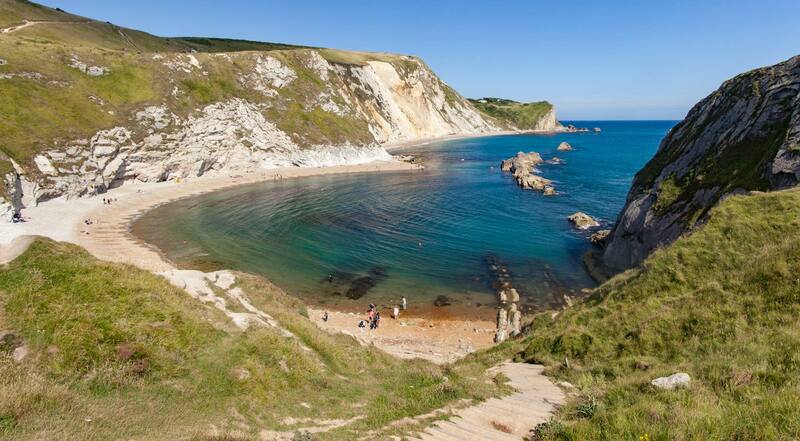 Durdle door looks amazing. Definitely adding that to my list! Thank you! Thank you, have an amazing time in the UK! Thanks for a very well written and detailed blog.